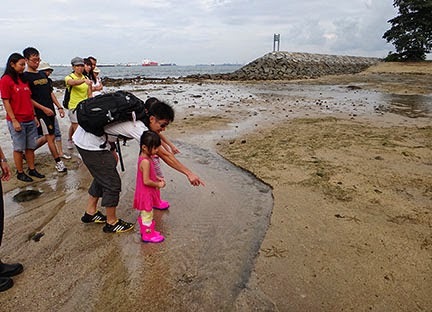 How nice to share our beloved Sisters' Islands with wonderful visitors on the very first public walks conducted at Singapore's first Marine Park! 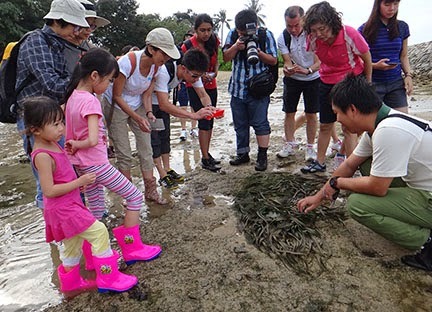 Here's more about what to expect during a public walk to Sisters' Islands Marine Park organised by NParks. 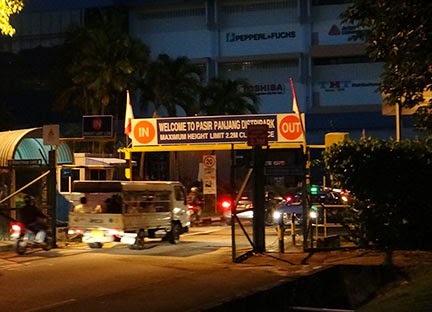 We depart from Pasir Panjang Ferry Terminal. This is a huge and busy terminal! So add plenty of time to find your way there. Parking is very limited (most lots are season parking). Where do we meet? 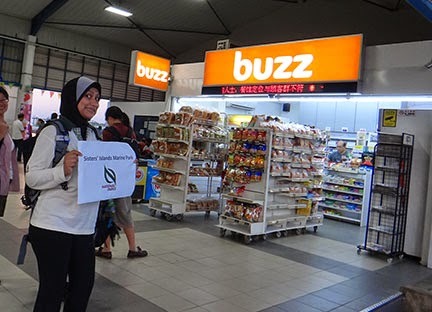 Look out for the friendly NParks officer holding up a sign 'Sisters' Island Marine Park Tour' near the 'Buzz' shop! We have to leave punctually because the tides wait for no man. So, don't be late! We take a large ferry. 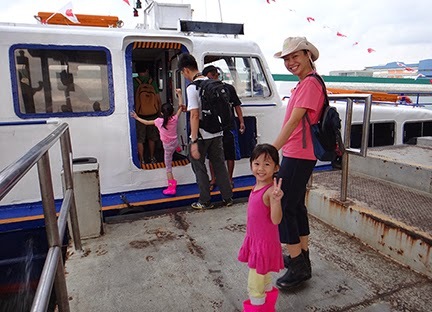 Although the ferry is quite stable, the ride can be choppy depending on the weather. So if you are prone to sea sickness, please take appropriate medication beforehand. The ferry ride takes about half an hour to 45 minutes depending on the weather. Along the way, guides will share about the many islands and activities going on in our waters. 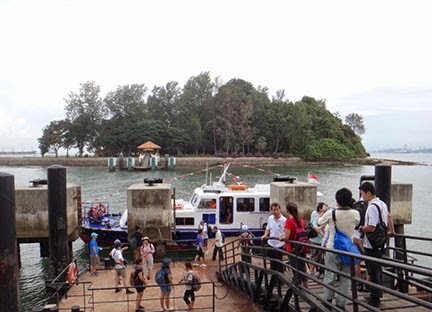 We arrive at jetty of Big Sisters' Island also known as Pulau Subar Laut. 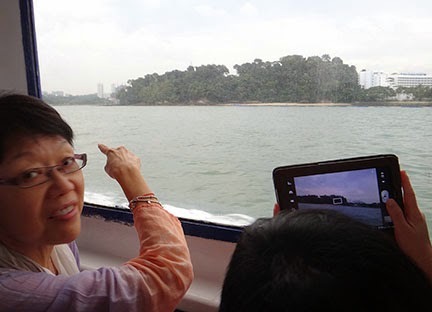 Opposite is Little Sisters' Island also known as Pulau Subar Darat. 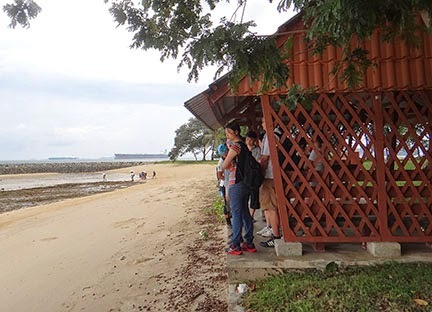 At the jetty, if the visibility is good, we can have a look at the living corals along the reef edge. We may also see colourful reef fishes. It's like an outdoor aquarium but one which we don't have to clean or feed the fishes! 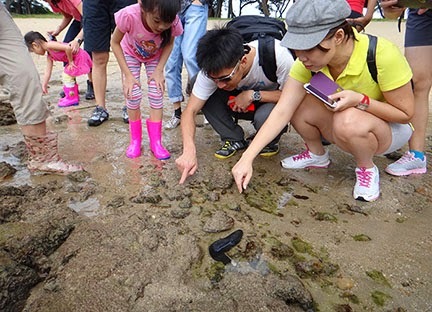 One of the highlights of the tour is a closer look at a Fluted giant clam not far from the dry part of the shore. A little bit of sloshing and we can have a look at this amazing animal that settled naturally in the lagoon, it was not planted here. 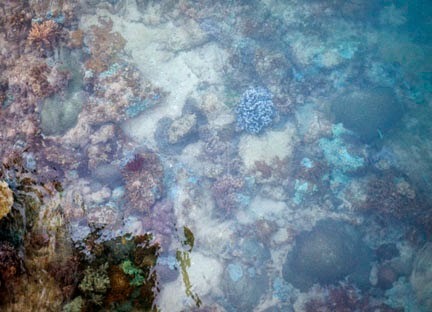 There are also lots of corals around it, as well as at a 'coral garden' in another corner of the big lagoon. To protect our feet, it is important to wear covered shoes. Suitable shoes include old sports shoes with laces and diving booties. Galoshes or 'Phua Chu Kang' boots are ok, but once they fill up with water, it can get hard to walk. Please don't wear sandals. It is not possible to walk safely in slippers or flip flops. For your safety, people without safe footwear will not be allowed to come down to the shore. There are large Carpet anemones on the shore. They feel a little 'sticky' when we touch it gently (No poking!). This is because it is stinging our skin but our skin is too thick so we don't feel the stingers. But small animals like fishes and shrimps can be overcome by these stingers. Despite these stingers, very surprisingly, some shrimps have adapted to live safely in the anemone! 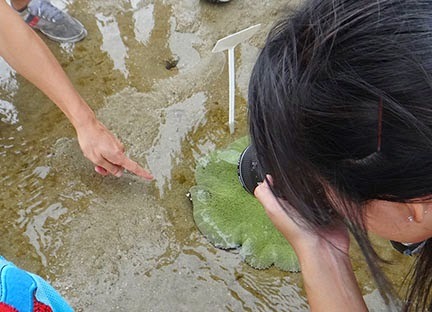 Here's one of the visitors pointing out the anemone shrimps that we often see living in the large Carpet anemones on Sisters Islands and our other shores. There are also all kinds of tiny to large animals living in the rocky areas! 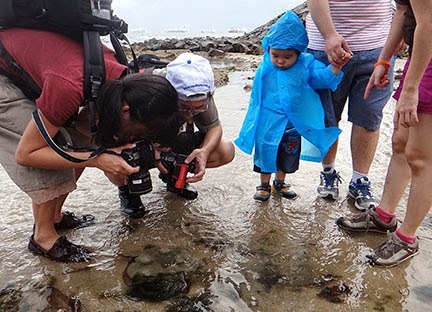 Usually, the kids are the ones to spot all the interesting animals! 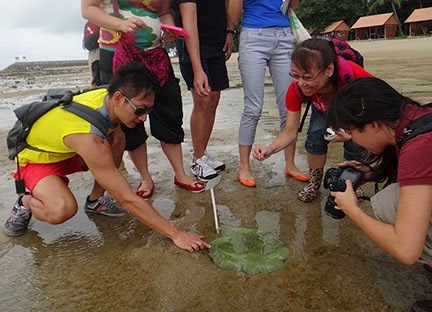 In the sandy areas, there are Common sea stars as well as other curious creatures. There are also some seagrasses on the island, which form an important underwater meadow where small fishes and creatures find shelter. In case of rain and especially when there is lightning, we can quickly shelter in one of the many huts on the shore. These are equipped with lightning protectors. It is good to pack along a raincoat because we will usually continue the walk if there is only light rain and if there is no lightning. The tour is not ideal for those who are not able to walk at a relatively brisk pace on soft or uneven ground. 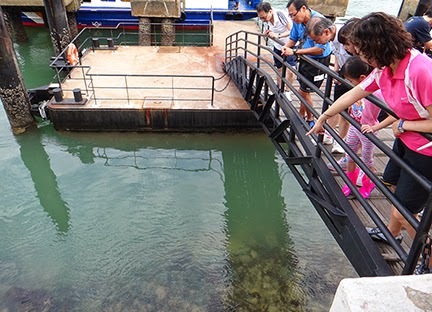 Because the low tide usually only lasts about an hour or so and we have lots to show everyone! Getting on and off the ferry may also be tricky for those with walking difficulties. 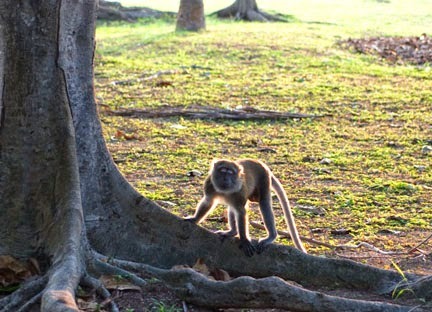 There are some Long-tailed macaques on this island. But they will leave us alone if we do not bring food or plastic bags with us. These can be left on the ferry while we do the walk on the island. 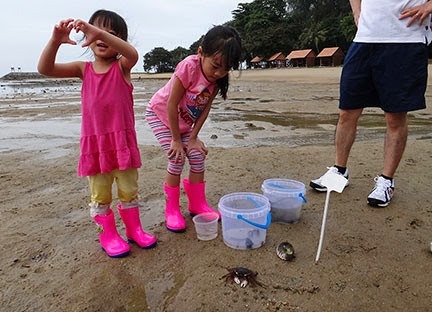 While guides are bringing visitors around, NParks officers and volunteers will be working hard as 'seekers' to find interesting animals in deeper water and bring them to the high shore in buckets. At the end of the walk, visitors can have a look at them. 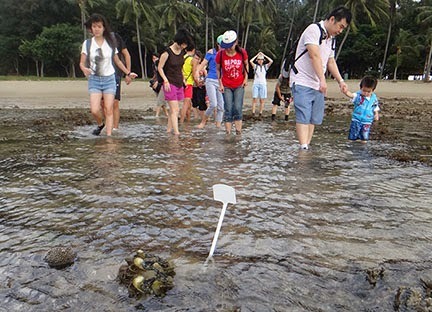 In this way, visitors won't trample the shore and avoid getting hurt. Afterwards, the animals are returned to where they were found. 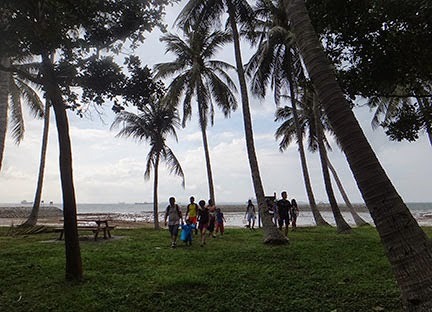 Dates and online sign up details for public walks are on the NParks website. Hope to see you on one of our walks! 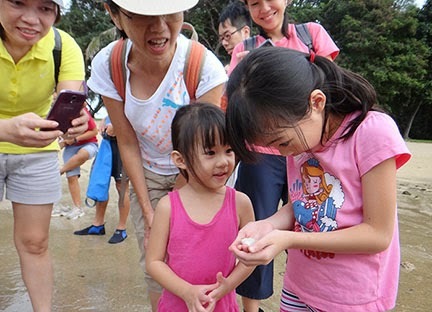 Singapore's first marine park is unveiled!